Here is a list of all the Freedom Of Information (FOI) requests that have been put in regarding the Ian Puddick Case and Operation Bohan and Operation Marten. To date, not a single one of them has been answered by City Of London Police or anyone else for that matter! This begs the question – who is accountable for failing to respond and answer these important questions and if they won’t answer even under an FOI request then does the system of putting FOI requests have any value or any teeth – we think not. What we do think is that the FOI system is just another scam by the government to make it look like they are accountable to us but in reality they hide behind it giving out “acknowledgments” and refusing to answer the questions being put to them! Here are all the FOI requests that have been put in regarding Ian’s case! All FOI’s were acknowledged but never answered! The only FOI immediately addressed and refused was who authorised firearms and on what grounds? Refused?? 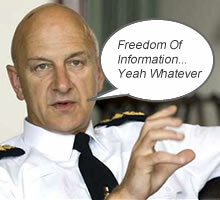 If they can refuse an FOI request then the system is WORTHLESS!